1. A large number of people thought they could levitate. 2. They were wrong. For five years the U.S. real estate market was a farcical circus of self-delusion and deception based on the belief that house prices would keep rising indefinitely. In the history of finance, farce is always a prelude to tragedy and the tragedy has now begun in earnest. Over the past twelve months thousands of subprime mortgage borrowers walked away from their obligations triggering the biggest flameout in real-estate history. In the first quarter of 2008, 1 in 78 households in California received a foreclosure filing. In Nevada, the rate is even higher at 1 in every 54 households (Source: RealtyTrac). Weve seen the implosion of mortgage brokers (including Countrywide Financial, which we warned readers of in our October 06 column). Weve seen the collapse of brokerage house Bear Stearns, the bankruptcy of Indy-Mac-- the second biggest bank failure in U.S. history and the emergency government bailout of mortgage giants Fannie Mae and Freddie Mac. - So-called Alt-A mortgages, loans that are just slightly above subprime in quality. Foreclosure rates on Alt-A mortgages have doubled in Southern California. Over twenty percent of Alt-A borrowers are already behind in their payments. - Prime rate mortgages: During the first quarter of 2008, 195,000 subprime mortgages and 117,000 prime-rate mortgages were foreclosed in the U.S. But the rate of increase of prime-rate foreclosures was 32 percent compared to an 11 percent annual increase for subprime mortgages. - Home equity loans. When prices were skyrocketing a few years ago, homeowners borrowed over US $1.1 trillion against the value of their houses. The money was used for everything from new cars to vacations. Now with prices plummeting and refinancing scarce, these loans are in jeopardy. - Consumer credit card loans. Default rates are creeping up: 6.4 percent of consumer credit card accounts are in default up from 4.51 percent in February 2007. On top of these dire statistics comes the worst indicator of them all - the U.S. unemployment rate has risen to 5.7 percent, a four year high. Rising unemployment means the U.S. is entering a negative decline spiral. As people lose their jobs, they cut back on spending, putting even further pressure on the economy. Whats does this mean for us in Canada? Canadian investors can be forgiven for being complacent. The TSE is still almost 15 percent above the level it was two years ago. Weve benefited from skyrocketing commodity prices. Oil prices soared to record levels. (The prediction I made a year ago for lower oil prices proved badly wrong or at least premature). But complacency isnt wise. The storm south of the border will eventually make itself felt here. Canadian bank stocks have already been pummeled and it wont be long before the rest of our economy feels the pain. The question that readers may be asking: Wont the U.S. economy bounce back quickly as it has in the past? Why is this downturn any different? The answer is that credit crises are fundamentally different from typical recessions. When banks suffer huge losses and write down billions of dollars in capital there is a huge ripple effect. Banks make their profit through leveraged lending. For every dollar of capital they have on hand, U.S. banks are allowed by law to lend out ten dollars. Think now about the US$400 billion that U.S. banks have lost so far in the crisis. That translates roughly into $4 trillion dollars of liquidity that the banks are no longer supplying to the economy. Even consumers and businesses with good credit will have trouble getting loans. No wonder the $100 billion tax rebate that was implemented by the Bush administration in April had little effect. The stimulus program sounds like a lot of money but its completely dwarfed by the trillion-dollar credit tightening by the banks. And as banks lose more money, this situation will get worse. Japans financial credit crisis began in 1990 when their real-estate market collapsed after a decade-long bubble. Their primary stock market index, the Nikkei 225, plummeted from about 40,000 to 15,900 in two years. And then it went sideways for another ten years before plunging to a new low of 7900 in 2003. 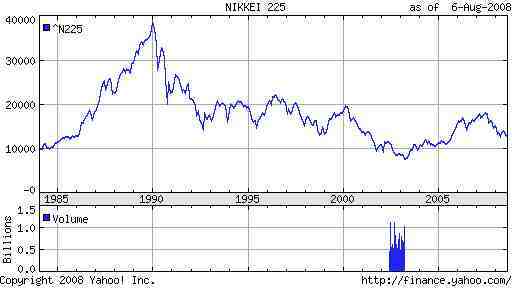 The critical point is that the Japanese investor who invested at the peak is down 67 percent after almost two decades. So much for the triumph of the long-term investor. We cannot say that the U.S. will repeat this dismal experience because each crisis has its own particular dynamic. We simply dont know the answer to the key questions. How much bad debt will need to be written off? What policies will the Federal Reserve and the new incoming president implement? At what point will unemployment peak? On the other hand, we cant rule out worse scenarios either. Note that Japans crisis happened while the rest of the world had strong economic growth. Its hard to imagine, but Japan would have had an even rougher time if the global economy hadnt buoyed them up. The bad news is that if we look at todays credit crisis, there are signs that the slowdown is global in scope. Shanghais stock market is already down more than fifty percent from its peak last October while Indias Bombay Sensex index is down twenty-five percent from January. If we fall, there will be no one to catch us. Does all this talk of plummeting markets scare you? If it does, then it is likely you have too much money invested in the stock market. Most people overestimate their risk tolerance because they dont think about the downside during a bull market. Very few people (I certainly dont know any) can calmly steer a portfolio that is 100 percent invested in stocks through a severe bear market. The right way to address the discomfort is to adjust your stock market exposure. The wrong way is to panic and sell everything (unless you really need the money). If your portfolio is thirty percent stocks, even a bear market drop of fifty per cent will only impact your net worth by fifteen percent. The other mistake is denial - believing that a stock market crash will never happen. That would be like living in New Orleans and ruling out the possibility of a Katrina.